One company that listens to the fans is Unbox Industries, with collectors demanding a bigger run of Ziqi’s Little Dino because they simply can’t get hold of them without having to pay crazy aftermarket prices. You would think the number of variants and releases of Little Dino there would be enough to go around. Looks like it’s not been the case judging from social media. 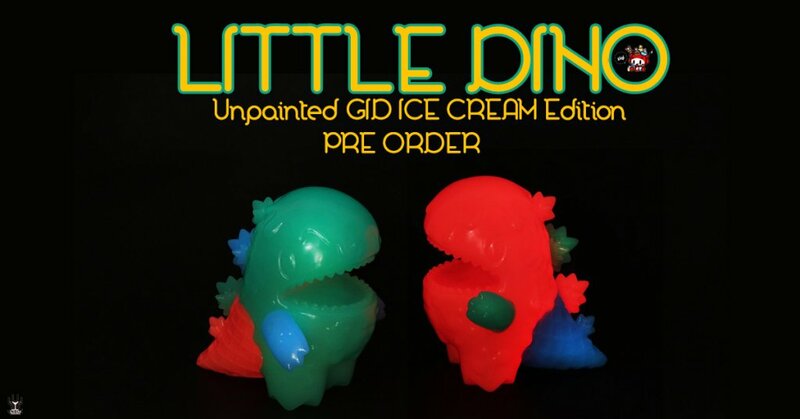 Unbox has done the unexpected, TIMED PREORDER for LITTLE DINO UNPAINTED “GID ICE CREAM’. Everyone’s favourite ice cream dinosaur is back with a new flavour! This edition is a very special glow in the dark “mixed parts” unpainted figure produced for Wonderfestival Japan. TODAY will be the day to pre-order the 2nd round. Ice Cream GID Dino with randomly mixed parts! DUE TO THE RANDOM ASSEMBLY PROCESS THE COLOUR MIX OF EACH DINO MAY DIFFER TO THE ITEMS SHOWN.